A student need not be a Seventh-day Adventist to apply; however, the high school is a Seventh-day Adventist Christian school and has as its definite purpose the development of spiritual ideals. Therefore, students who are irreligious or make light of religious matters, have atheistic tendencies, or do not plan to come for the purpose of developing their spiritual qualities should not apply for admission. Students of other religions are welcome, provided they show due respect for the Word of God, maintain a reverend attitude during religious exercises, and observe all the regulations of the school. Uniforms are to be used every day rain or sunshine. 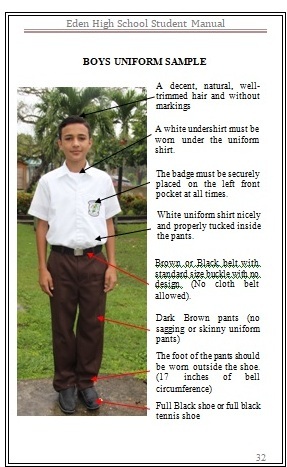 Student’s uniform will be checked periodically to ensure that they meet the standards; should there be inconsistency parents will be notified. The P.E. T-shirt is not considered part of the regular school’s uniform. Students must be in full uniform while attending any extra classes including choir practices. 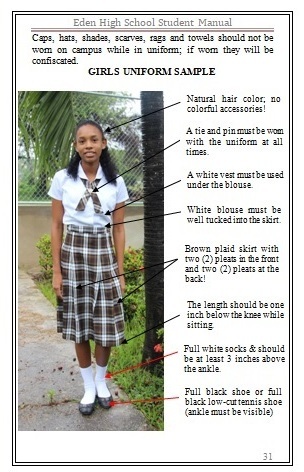 Students must come to school in proper uniform. If this is not adhered to, the student must bring a note from the parent explaining the reason for the child to be without proper uniform. Eden High has the right to accept or reject the reasons presented. Students who do not present a note from Parents/Guardians will be charged a fee of $5.00. Forging Parent/Guardian’s signature is a serious offense and will be dealt with by the Disciplinary Committee. Note must include date, signature and contact number of parent/guardian. At the end of the day, students must leave campus and return home properly attired in their uniform. Students’ identification card must be visible at all times, including while on field trips and other school related activities. Application forms for admission must be in the office by the last week in May. After this date a late fee of 10.00 will be charged. The admission committee reserves the right to accept or reject any application. Students entering Eden High School should have completed Standard Six at the primary level and obtained an adequate pass on the PSE. They must fulfill the other requirements stipulated on the application form. The student must be conscious that he/she is coming to study and must be willing to obey all rules and regulations that govern the conduct on or off campus. The student must read and understand the principles as stated in this handbook and must be willing to abide by the same. Students who apply for admission to Eden High with a failure from their previous institution will be required to repeat the form they failed before being promoted. Students entering first form are required to attend a 2 weeks summer course; failure to comply will forfeit their acceptance.